Our FastTrack Birmingham Office have submitted a team for the Charity ‘It’s a Knock Out’ Event on Sunday 3rd May 2015! Our FastTrack Team will be raising money for Motor Neurone Disease in support of Tom Stevenson, a fellow consultant over at PSR who has sadly recently been diagnosed with the disease and it therefore raising both awareness & money for the cause! 'The Battle Fund' was set up by Tom when an overwhelming amount of support was shown to him following his diagnosis. The fund will provide Tom access to Alternative treatments, of which are not currently available on the NHS. The fund will also help pay for costly travel arrangements for any treatment or therapy available outside of the UK etc. If deemed necessary the funds raised would also be used to improve the quality of life for Tom through his journey with his diagnosis. It provides emotional and financial support to Tom Stevenson and his wife Lian during their battle to defeat Tom's diagnosis of Amyotrophic Lateral Sclerosis. The initial shock was terrible but he thought about how he was going to fight this battle. There are two paths to go down, one is to sit back and hide away and deny it, not see anyone and let the stress and anxiety eat him up which is what the disease wants him to do, or the other path which is to accept it and put a plan in place to defeat it. The brain is a very powerful machine which can be fixed as long as you have the right mentality and support around you. At the moment there is no cure, but isn't that the same for many illnesses? There are excellent treatments and with help from others STAYING POSITIVE and BELIEVING that we are going to get through this battle then that is the best treatment anyone can have. He is not looking to receive sympathy, he wants to see positive responses because he is a strong individual and will beat this but he will need the help from family and friends on this journey. He looks at this like a game of blackjack - him against the dealer. He has been dealt a bad hand a 10 and a 3, the dealer gives himself a King, Tom has two options. Stick on 13 and accept the dealer will beat him or take a gamble and fight and defeat him and turnover an 8. FastTrack have managed to donate £250 to the cause and now it’s your turn to help! Please share ideas and interact with the rest of Tom's Army, create awareness of your fundraising ideas etc. Together we can beat the dealer! Infographic! 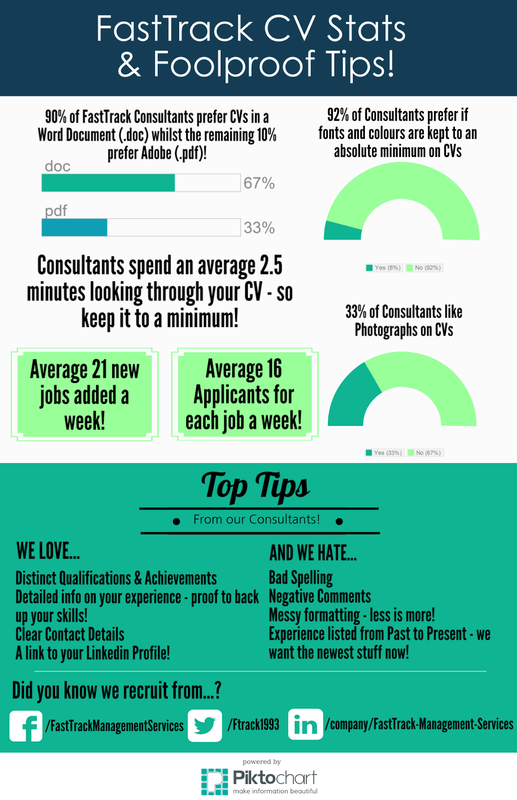 FastTrack CV Stats & Foolproof Tips!